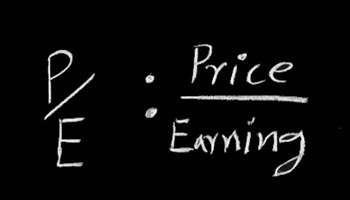 P/E is the price / earnings ratio – sometimes called the PER. It is the ratio of a business’s or company’s earnings per share (EPS). The ratio is used for valuing a company by calculating the company’s share price relative to the company’s per-share earnings. The PER is sometimes also referred to as the ‘earnings multiple’ or the ‘price multiple’. The price earnings ratio is more easily understood as the pound or dollar amount that an investor would expect to put into a company in order to get one pound or dollar out of that company’s earnings: it essentially shows how much an investor is prepared to pay per pound or dollar earnings. For example, if the P/E multiple of a company is twenty, then an investor is prepared to pay twenty pounds or dollars for one pound or dollar of current earnings. To calculate a company’s P/E ratio we need to know the EPS (earnings per share). The EPS of a company is typically calculated from the last four quarters of operation. When this calculation is employed, it is referred to as the ‘trailing P/E’. We arrive at the trailing P/E by taking the company’s current share value and dividing it by earnings per share over the previous year. Sometimes analysts create a ‘forward P/E’ or ‘projected P/E’ by estimating the earnings expected over the next four quarters of operation. Another (less usual) way of calculating the forward P/E is to consider the last two quarters of operation and estimates for the next two quarters of operation. Under most circumstances, if a company has a high P/E, then investors expect to see high future earnings growth compared to a business that has a lower P/E. It should be noted, though, that if a company has a low P/E, then it may be that that company is undervalued. If a company is posting losses, or has no earnings, then its P/E will be displayed as ‘N/A’. A negative P/E ratio is technically possible but highly unlikely to be reported. It is widely accepted among the financial community that a negative P/E should be reported as ‘not applicable’. The P/E ratio is a useful insight into whether or not a stock is worth investing in. However, just like any other metric that is used to assess value, the calculation has certain limitations. A P/E ratio for a company may vary across time because of the way that the company earns money may likewise vary. A P/E ratio may, for example, make a telecommunications company look superior to an energy company, but this apparent difference may be due to influences within a sector, as opposed to within the individual companies. With this in mind, the P/E ratio should only be used in conjunction with other metrics; once understood, it is a useful valuation tool for investors.